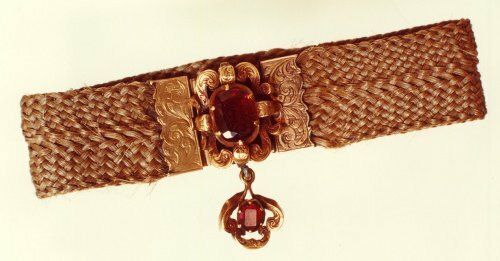 Take a look at the beautiful bracelet at the top of our latest Brontë blog; it’s one that was especially precious to Charlotte Brontë, and she wore it wherever she went, but what is it made of? At the centre is a sparkling amethyst but the strap around it is made of the intertwined hair of her dead sisters, Emily and Anne Brontë. It may sound a little macabre, or even odd, to us, but jewellery made from the hair of deceased relatives and friends was all the rage amongst the middle and upper classes in the early Victorian era, and there’s a good reason why. Photography was in its infancy in the 1840s, and a photograph was a luxurious rather than commonplace item. In short, people had no way of looking back at the faces of those they had loved and lost, so they did the next best thing – by keeping locks of their hair, sometimes arranged in a band and sometimes in ornate jewellery, they could always have a piece of their loved one near to them. Charlotte could no longer see her sisters, for example, but she could touch them, she could have them with her always by wearing their hair against her wrist. 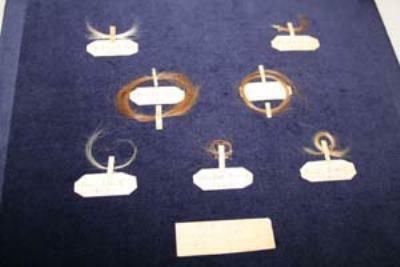 These items are among a number that are displayed at the Brontë Parsonage Museum in Haworth from time to time, and they have the hair of all three of the famous Brontë sisters. They have faded over time, and are now very delicate, but behind their glass case they are incredibly beautiful and moving too. We can not only read the great novels and poems of the Brontës, we can actually see their hair before us looking as vibrant as if it had been cut that day. Some have taken this to mean that all his sisters had red hair too, but this isn’t necessarily the correct reading of course. The description may simply mean that the first part relates to his sisters, that he was small. Anne and especially Charlotte were diminutive, although Emily was somewhat taller than average. Charlotte certainly did were spectacles, and had the exceedingly poor eyesight which dogged her father, but there is no evidence of Anne or Emily wearing them. It seems, therefore, that Grundy’s description is meant merely to illustrate that Branwell shared some of his physical characteristics with some of his sisters. In the pictures of Anne, by Branwell and Charlotte, she clearly has brown hair, and indeed she is described as having chestnut brown hair that was somewhat lighter than her sisters. The hair jewellery too, although it has now become lighter than it was, displays brown hair. As a redhead myself I’d love to claim the Brontës for the titian team, but alas it wasn’t so. Nevertheless, the Brontë hair bands and bracelets remain a true treasure of the Brontë Parsonage Museum, and a tangible link to the three young women we all know and love. What a lovely topic. Thank you for sharing with us.